In the first of a series of reports, BBC World Affairs Correspondent Mark Doyle analyses the state of food production and consumption across the globe. The tiny Indian island of Ghoramara, in the delta where the River Ganges meets the Bay of Bengal, is a symbol of the crisis the world is facing as it struggles to feed a growing population. It is a tiny place - just a few kilometres across - and it is getting tinier. The island, part of a chain called the Sundarbans, was first settled by farmers in colonial times when the authorities decided to expand rice production to feed the multitudes in the city of Calcutta. But when I visited Ghoramara there was powerful evidence that soil erosion caused in part by farming and the rising surrounding sea level caused by global warming were gradually making the island disappear. 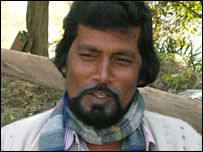 Ajoy Kumar Patra, the headman on the island, stood on the shore looking across the broad choppy waters. "This island and that piece of land over there used to be separated by just a narrow channel of water", says Mr Patra. "All the land which is now underwater used to be rice paddies". "Cutting down the mangrove that used to cover the island, to make way for farming, destroyed the ecology," he says. 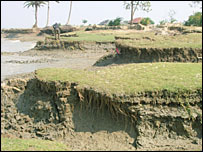 The mangrove used to bind the topsoil in position. Now it is being washed away. The farmers also used to dig wells to get fresh water for irrigating their paddies. But in time, Dr Hazra says, underground reservoirs emptied and then collapsed. Added to all that, "The sea level is rising around here, as it is everywhere in response to global warming", the oceanographer said. "So the land is subsiding and at the same time the sea is advancing." 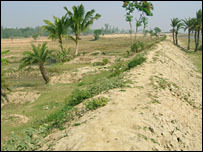 The farmers of Ghoramara have tried to save their island by building dykes around the edges. But Dr Hazra says this is just a short term solution that may make the situation worse. "The problem with the dykes is that they stop the sediment the river would normally deposit here from nourishing the island's soil. "The sediment is being washed out to sea rather than compensating for the rising water level." So the agriculture designed to feed the community on the island is in fact contributing to its death. Experts in food production say Ghoramara is a symbol of the dramatic combination of factors which mean the world is heading for extreme food shortages in the coming decades. Similar phenomena are taking place on other islands and in low-lying coastal plains around the world. The factors which are impacting on food production include soil erosion caused by intensive farming, and global warming which could reduce the yield of staple grains or make weather patterns less predictable for farmers. The relatively new phenomenon of bio-fuels - for example, the production of ethanol from corn which can be used to supplement petrol - may take a huge proportion of the output of the big grain farms in the American Midwest. "The global figures already show a drop in food stocks. We have got less buffer stocks than we have had for many, many decades," said Dr Tim Lang, a food and nutrition expert at The City University in London. "We are tip-toeing into the most enormous crisis." The over-consumption of food in many parts of the world is another issue. There are now more overweight people than chronically hungry, and the number of people with "diseases of the rich" like diabetes is increasing, including in developing countries. On current United Nations projections, world population is set to increase from 6.6bn today to over 9bn by 2050. "In terms of the basic cereals like rice, wheat and maize, we probably need 50-60%t more production by, say, 2030", warns Mark Rosegrant of the International Food Policy Research Institute in Washington. "And on meat production - pork, poultry and beef particularly - you really need a doubling." In the next report in this series, I will be exploring the factors which may limit the big increases in staple food output that the world's expanding population will require. I will be asking if, like the islanders on Ghoramara, we appear to have hit the buffers in terms of food production. For more information about food production and consumption tune to BBC World Service Radio on March 28, April 4 and April 11 to listen to the documentary series "Feeding the World" with BBC World Affairs Correspondent Mark Doyle, produced by Ed Butler.